For more details, click on the cover image. From the publisher . . . "In 1871, the Polaris sailed with great fanfare from New York harbor and began a historic journey to one of the earths final frontiers. Seven months later, a handful of half-starved survivors returned with a story that shocked the entire nation. . . . In the dark, divisive years following the Civil War, Americas foremost Arctic explorer, Charles Francis Hall, became a figure of national pride and renown when he embarked on a harrowing, landmark expedition. With financial backing from Congress and the personal support of President Grant, Captain Hall and his crew boarded the Polaris, a steam schooner carefully refitted for its rigorous journey, and began their quest to be the first men to reach the North Pole. Hall was a veteran of the Arctic and a man of great physical stamina, but all his strength and experience couldnt combat the conflicts brewing among his officers and crew. Beset by bad luck, a lack of discipline, and an unclear chain of command, the Polaris entered the icy waters off the coast of Greenland. Neither the ship nor its captain would ever return. As the expedition reached its most crucial stage, Hall inexplicably sickened and died. Whispers of murder swept through the ship. Still, the Polaris forged on, only to meet with a further disaster that left half the crew separated from the ship and most of their supplies at the bottom of the ocean. What followed was a horrifying, seven-month ordeal through the heart of an Arctic winter, when men fought starvation, madness, and each other upon the ever-shifting ice. 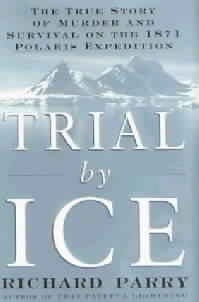 Trial by Ice is an incredible adventure that pits men against the natural elements and their own fragile human nature. Beyond this, it is also an authentic murder mystery that, in its time, led to accusations of foul play and a dramatic, unresolved investigation. Now, more than a century after the crime was committed, the author draws on recent evidence to recount the amazing story of the killer who boarded the Polaris and got away with murder. In this powerful true story of death and survival, courage and intrigue aboard a doomed ship, Richard Parry chronicles one of the most astonishing, little known tragedies at sea in American history. About the author . . . Richard Parry is a retired surgeon whose practice was based in Fairbanks, Alaska. He now lives in Sun City, Arizona. He is the author of three acclaimed novels about Wyatt Earp, as well as That Fateful Lightning: A Novel of Ulysses S. Grant. Another new book about the Polaris Expedition . . .
For details click on the cover image. For North Polar Regions maps, click here. Some previous books you might enjoy . . .
For more information, click on the cover image. A Note to Authors: please contact us at polarflight@arcticmail.com if you have a new north polar-related book that you would like us to consider for inclusion here. We will be featuring a different book each month. We are currently reviewing books for the Spring, 2002 issue.